Amy Winehouse Hologram Expected To 'Tour' With A Backing Band Proceeds from the concerts, featuring a holographic image of the deceased artist, would go to the Winehouse Foundation, which works to prevent drug and alcohol abuse in young people. 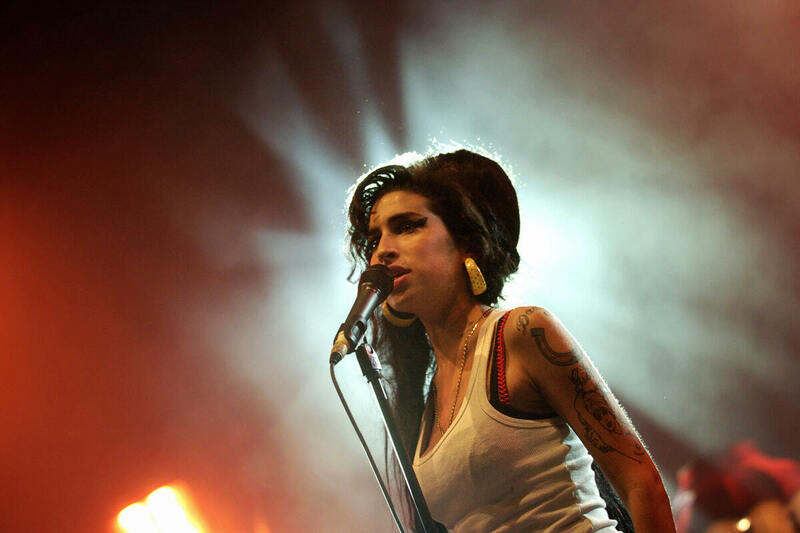 Amy Winehouse performs at the Eurockeennes Music Festival in France in 2007. A hologram depicting Amy Winehouse, the British singer whose music, addictions and premature death dominated headlines, is expected to embark on a tour, according to Reuters. Her father, Mitch Winehouse, told the news agency that the singer's hologram will be projected on stage along with her voice and a live band. The tour, set for next year, is part of a trend in recent years of concerts featuring projected likenesses of deceased artists. BASE Hologram, the company producing the Winehouse concerts, has also produced hologram tours of Roy Orbison and opera singer Maria Callas. However, unlike the Orbison and Callas holograms, which stand square in front of a microphone throughout the show, Winehouse's father wants to be sure that BASE Hologram accurately recreates his daughter's performances, which feature more dancing and movement, Reuters says. Proceeds from the holographic tour will reportedly go toward the Amy Winehouse Foundation, which works to prevent drug and alcohol abuse in young people and provide support to those struggling with addiction. The singer died in 2011 after attracting a legion of papparazzi and receiving international media coverage of her struggles with drugs and bulimia. As Amy director Asif Kapadia told Fresh Air in 2015, "Amy sold newspapers. If she was on the cover of a tabloid, it sold more copies. If she was on a website, they got more hits." The digital age was dawning, and "she was the unlucky one to be having a nervous breakdown in public at the time," Kapadia said. Holograms were brought to the mainstream's consciousness after a Tupac Shakur hologram "performed" at Coachella alongside Snoop Dogg and Dr. Dre in 2012. The light productions of beloved, deceased artists are not without their critics. As Jason Lipshutz wrote for Billboard after that Coachella performance, "Watching a visual re-creation of the rapper traipse around the stage in choreographed movements felt incorrect." "Pac's life was special, and that unique flame has been extinguished," he wrote. "Why do we need to watch an imitation of Tupac when we have an incomparable plethora of his own art at our disposal?" And as NPR's Ann Powers has said, "A conscientiously created hologram might afford insight into performance styles of artists no longer available to observe." The Winehouse family will have final approval of the show, which is expected to last between 75 and 115 minutes, according to Reuters.